Dark Horse and HBO Global Licensing are proud to honor Game of Thrones fans with the newest addition to the partnership’s line of popular collectibles: the Hand of the Queen Pin. After the Second Siege of Meereen, Daenerys Targaryen names Tyrion Lannister as her official Hand of the Queen to honor his loyalty and governance of Meereen during her absence. Daenerys presents Tyrion with a replica of the Hand brooch. 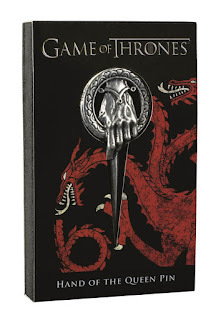 Dark Horse has crafted a replica of the original prop from Game of Thrones. The Hand of the Queen Pin is beautifully constructed with zinc alloy. The pin is three inches long. The Hand of the Queen Pin goes on sale December 28, 2016, at a price of $12.99.